Thread: C.O.W. - #061: Iceberg Devourer - Voting! A deep-sea creature by nature, this ocean giant can be found in both the Arctic and Antarctic Oceans clinging to the bottoms of icebergs. The increased salinity of the ocean depths acts as a slight toxin to the Igens Glacies Venterius, and it has discovered that the perfect way to dilute the excess salt in its system is to slowly swim up to the surface in order to feast on the pure fresh water found in the iceberg. Using its mandibular hooks it grasps onto the bottom of a found iceberg and engulfs the lower portion in its thick rubbery maw, grinding away at the ice with rasp-like teeth deep within its mouth. The skin surrounding the mouth is extremely thick and rubbery to avoid gashing itself on the sometimes jagged ice, while the rest of the creature's body is covered in very loose wrinkley skin to aid in the inevitable swelling that occurs once it has consumed the entire lower portion of the iceberg. iceberg gophers, really. Communal reptile like mammals that bark. but even this gigantic body isnt strong enough to withstand the enormeous heat from the magma. You thought the titanic crashed on an ice berg?.. think again.. This legendary ghost "lives" in south of polar circle. 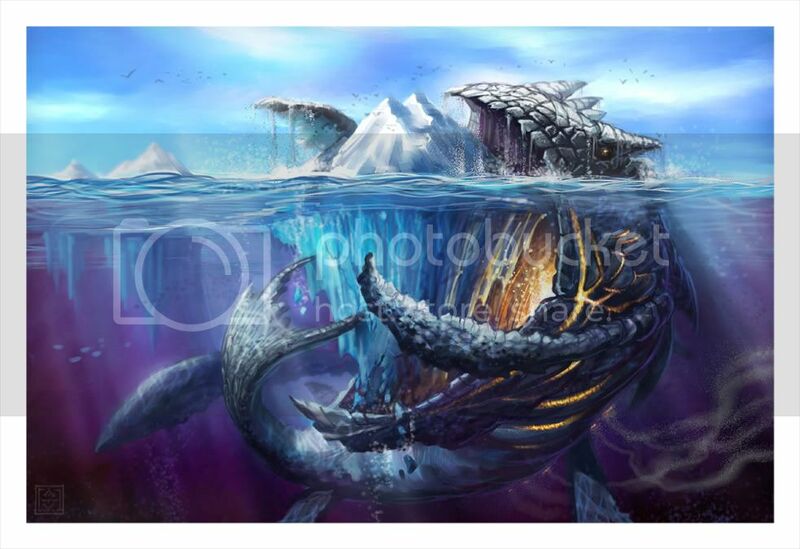 For Hunting the titanic dragon must blen into his corpse many piece of ice floe or icebergs, to become material. Step by step his energy dissolve his corpse of ice and he must redo it to hunt anymore. With his huge size he can attack a ship as tall as a tanker. Finally man kind has found a way to extract a useable fuel source from the heart of Arctic Icebergs only to find that the process has caused the jelly fish to mutate and feed on it. 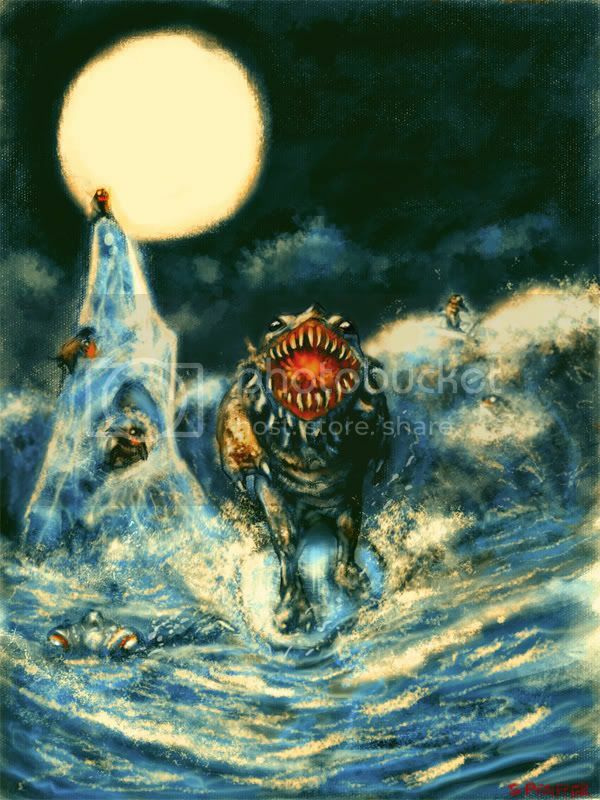 The Iceberg Devourers from the frigid waters of [Planet X] are a dangerous mammal that use a gland in their mouth to superheat their massive bony jaws. They in turn use their ultra-hot jaws to attack unsuspecting icebergs from below. The Lotenhoss is a rare mammal which lives in the northern polar region. The male is extremely territorial and can’t stand the scent of another male. When encountering urinated spots, normally smaller icebergs, it stays in place until it has devoured the trace entirely, which usually means eating the whole berg. The Lotenhoss can reach a length of 30 feet. It lives mainly off seal, occasional polar bears, and larger fish. No specimen has been sighted in well over 80 years, due to heavy hunting in the early 20th century. Creating and managing a world is a tough job, to put it mildly, so the young gods were each assigned partners with which to share the responsibilities. One such pair consisted of Baarj and Vililiuru. Baarj enjoyed creating weather and Vililiuru scored well in creating organisms and ecosystems, so the elder gods thought that the two would be able to combine their talents and create a nice world. They were wrong. The planet they were given was nice and mild, with an even mixture of flat land and shallow seas. Vililiuru envisioned a land of striding beasts and great schools of fish, so he asked Baarj to create a temperate climate in which his creatures could thrive. Baarj hated the idea of such a bland climate; he hoped to create a planet of grinding glaciers and howling winds. The argument escalated until the two attempted to smite each other, then they went and sulked on their own corners of the planet and did with it as they wished. True to his world, Baarj whipped up some truly foul and icy whether, and soon his side of the planet was covered in glaciers and icebergs. Vililiuru was less successful, for it is difficult to create good creatures without a good climate. The best he could do was a species of algae that thrived in ice. So, in frustration, he created the berg-hemoth. At well over a hundred meters tall, it was a formidable beast, able to easily wade through the planet's shallow seas in search of its favorite food: icebergs. 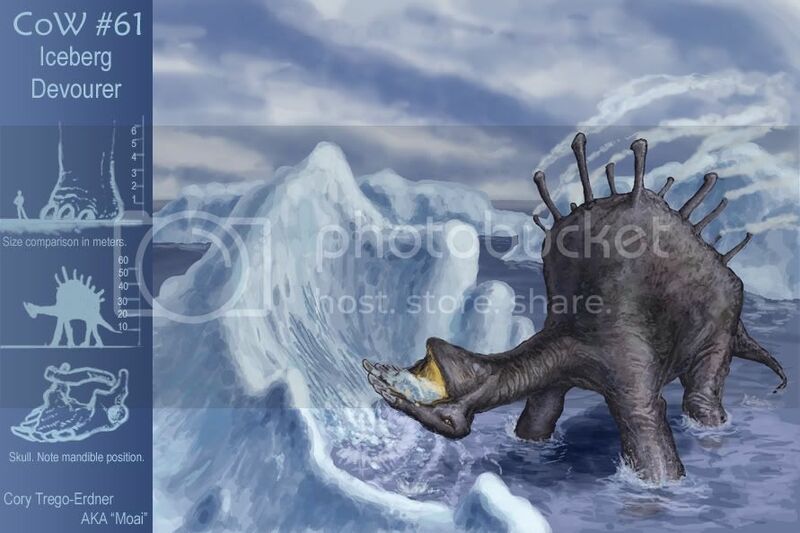 The berg-hemoth's shovel-shaped jaw and spatulate teeth allowed it to scoop up fast quantities of ice into its gullet, where it was evaporated by its furnace-like digestive system. The steam was released into the air through several organic chimneys on its back, along with carbon dioxide, a by-product of its digestive process. The creature's furnace-like body cavity was fueled by hydrogen leeched from the swallowed water, and all nutritional needs were provided by the algae that thrived in the icebergs. With dozens of these beasts consuming icebergs and releasing greenhouse gasses into the atmosphere, the tide of the struggle turned to Vililiuru's favor. In response, Baarj brew up the coldest, iciest, stormiest whether he could muster. And so the battle between the two young gods raged on. The elder gods looked down at their misguided students and shook their heads. This rare species of spider has never been documented by scientists, but from the few blurry photos taken, it is believed this amazing spider somehow uses nuclear fission to warm its body while in the dark depths of the ocean floor. 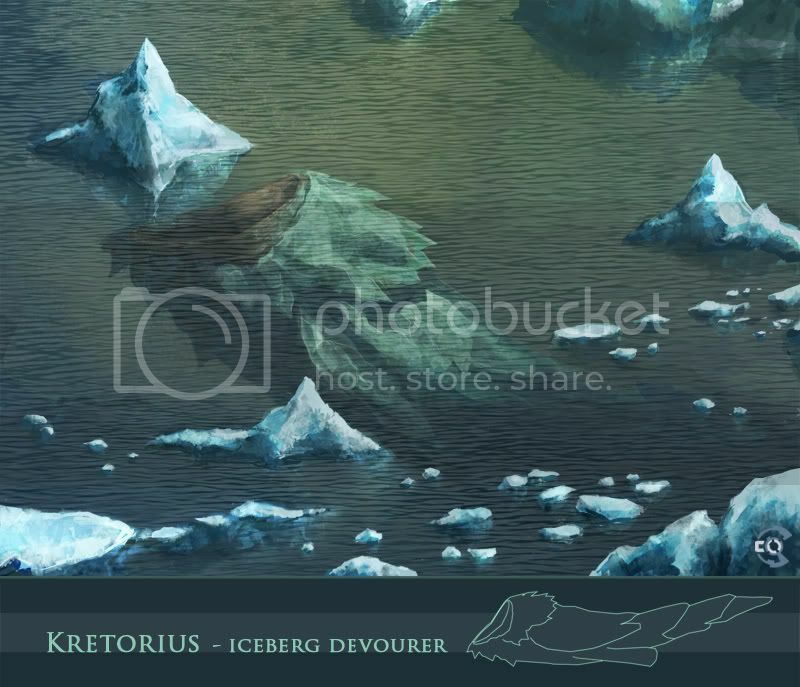 The only reason we can concieve this creature would come to the surface to devour massive chunks of floating ice, is due to the rather shallow waters it has been photographed in. It is possible, while migrating, the water can no long cool the creature when it reaches shallow water and it must consume a massive piece of ice to cool its inner core. Further research is required. This massive alien sea creature uses icebergs as a nursery for it's unfertilized eggs. The female will deposit the eggs in the arctic regions of the planet. The eggs form one large pod that the iceberg forms over time. The eggs can lay dormant for centuries until a male of the species detects their presence within the ice. The male will devour the iceberg and uses a thermal reaction within his body to melt away the ice and awaken the eggs for internal fertilzation. The fertilized eggs are released threw special blow hole like vents on the back of it's body. 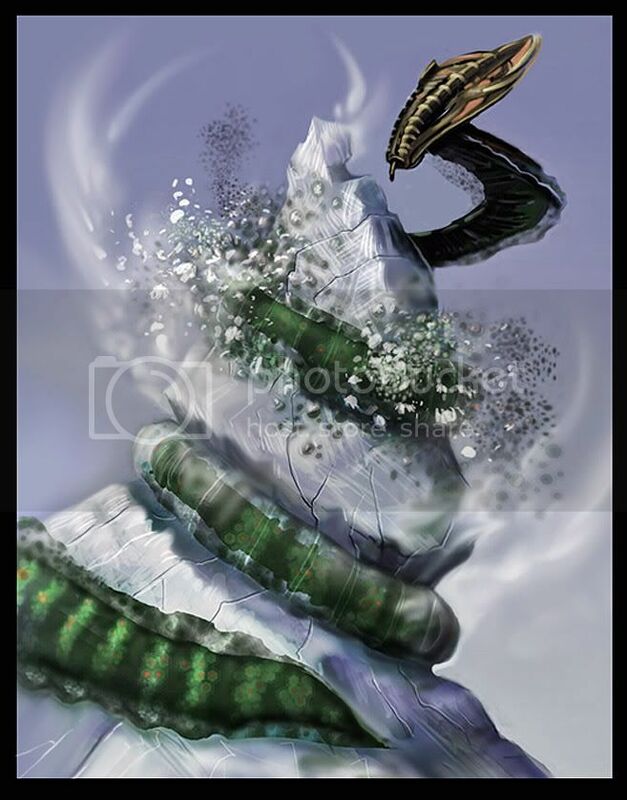 The Solar Constrictor uses a combination of heat collected from the sun, friction and an acidic compound is secretes from her translucent to break apart and melt icebergs to feed herself and her young. They drink the melted ice through small tubular tongues. The planet of the Solar Constrictor underwent a flash-freeze ice age, and while its finally warming up, most of natures meals are still locked in the ice, like a frozen soup waiting to be thawed. 70 million years ago this humongous sea turtle was present on every stretch of ocean in the planet, rivalling the largest pre-historic whales in size. Gently cruising the dark waters, its shell served as a a reef for many migrating species of fish around the globe, and resting place for proto-birds in their oceanic flights. Its diet consisted of all kinds of marine life, swallowed in swarms by the titanic mouth. But as the Earth's climate changed, the numbers of this magnificent species declined sharply. In need of enormous quantities of oxygen in the air to live, The Megachelonia was unable to cope with a new mixture of gases slowly being introduced in the atmosphere, and a large quantity of them simply could not breath in this new nytrogen-rich environment. A small population living in the arctic, however, found a way of fending off imminent extinction. when they came out of the water to breath, they always did so nearby an iceberg. The reason s simple: They found out they could crush the ice with their serrated jaw and swallow large quantities of it, freeing pre-historic air bubbles rich in oxygen able to keep them alive. This desperate measure is only enough to maintain a bare subsistence for the small population, which is slowly declining and becoming smaller with every generation. The accelerated melting of the ice caps is only precipitating the decline, and the species will be completely extinct is the next 30-50 years. 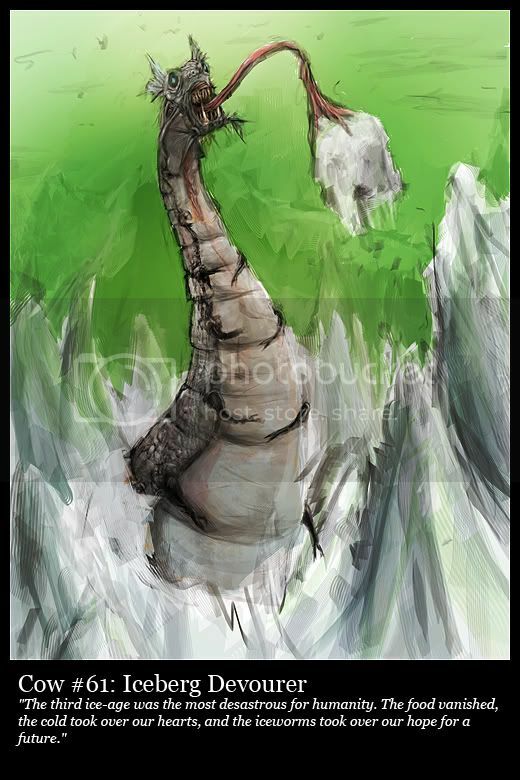 This unusal creature has discovered the huge store of minerals and nutrients trapped in the frozen `bergs as they formed hundreds of years ago. The purity of this food source persuades the usually reclusive Thermalids to rise to the surface from the deep sulpher warmed ocean trenches where they usually reside to feed upon the gasses released from the newly broken off icebergs as they wrap there super-heated bodies around them. 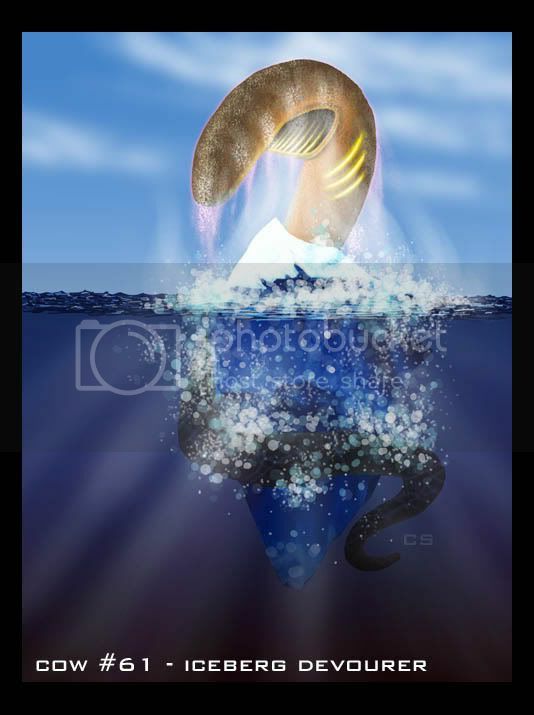 They use their unique `vapour gills` to absorb the goodness and filter out the polutants. Sightless and with no mouth, they will use their sensitive electro sonar to create a vision of the world around them. Their usual food source are the deep sea vents gushing out various gaseous nutrients and minerals. 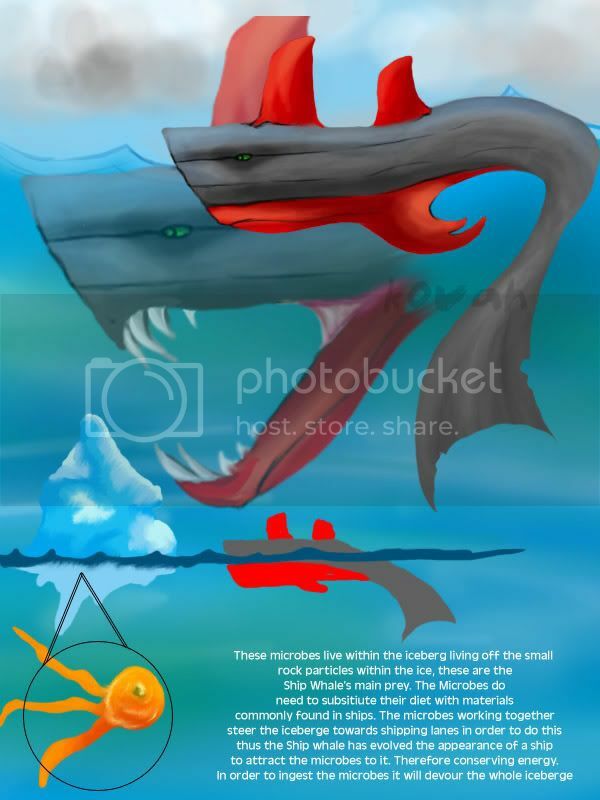 This weird creatures usually swim in the sea around the polar areas...they often use icebergs to bridge long distances. To do so they climb on icebergs, clutching them and use their back-sails in interaction with the wind to slide through the ocean. When the mating season arrives the Iceberg Huggers show another unique attribute. Fertilised females clutch icebergs and begin to bite off ice and snow pieces and swallow them. They don't do this for feeding purposes! As it often happens in most cataclysms, the simplest form of creatures seems to have taken over the more complexe ones. 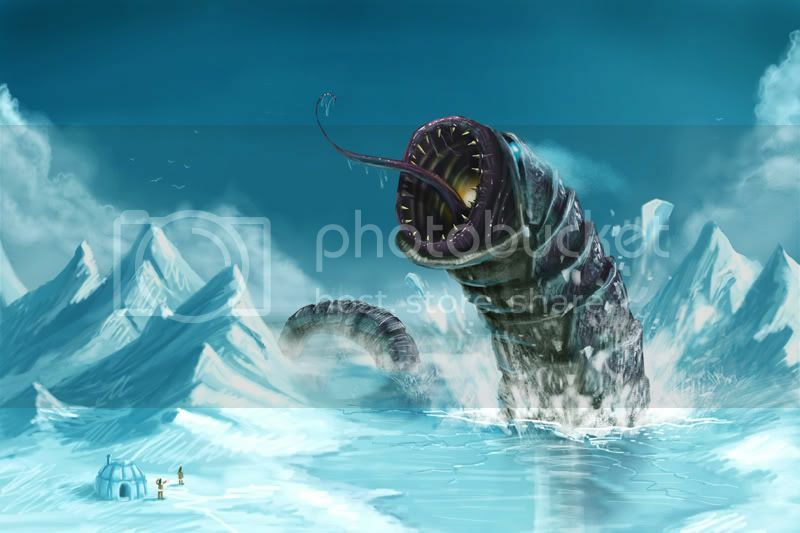 With their very long elastic-acid tongue and their sharps teeth, the "Iceworm" eat ice at an astronomic rate in hope to catch dead frozen animals in their bites. This giant mass of blubber (used to keep warm in such harsh environment) travels slowly accross the ocean. It opens its great mouth to devour icebergs in its path. The Bo-Tija might use its teeth to crush bigger icebergs, but it rarely needs to. It will continue this until it has made a clear path. They are known to be the cause for the decline in the polar caps. Insects are organisms, that can be found in every place on Earth. Recently, scientists found its representatives near Polar Pole, drifting inside iceberg. Polar Ants, this talk is about, take the advantages of low but stable temperature povided by iceberg's interior to build there nests. In upper part, above water surface, only main shafts are bitten out. All important structures, like Queen chamber, storage rooms, nursery and more, are placed much lower. Drifting home provides safety and also opportunity to hunt. They primarily feed on animals that feel exhausted and look for place to rest after long swim or fly. Low temperature allows to storage food for long time. Within few generations, they usually decrease weight of iceberg to 70% of its initial stage. It is caused by endlessly rising number of tunnels and chambers. It can be said, they eat icebergs from the inside forming their homes. In the days before the New Ice Age, the Southern Souldrinker preyed up small, weak-minded mammals, tearing them open with its hude claws and siucking up its blood through its proboscis and its soul through its long, hollow horns. As the blood provided vital nutrients, the souls were kept alive in a specialised organ on the Souldrinker's belly, and used as a source of heat in the long winter months. However, as the global temperature dropped, many of these species died out, and the Southern Souldrinker was forced to migrate north towardds the equator in search of food. It began to prey on larger animals; then, as even these grew scarce, it began to venture into human habitation to feed on the men and women who lived there. However, the strength of the human souls had unprecedented side-effects. Unused to the heat and vitality of the souls, many Souldrinkers died, bursting into spontaneous combustion. The number of Souldrinkers dwindled, hunted by humans, and when the atomic bombs began to fall on many of the southernmost continents, the waters grew poisoned and the great plagues continued to wipe them out. However, an enterprising and unwise group of highly trained genetic engineers intervined, determined to save this unique, if dangerous, species. They held almost all the remaining souldrinkers in captivity, feeding them on dried and preserved meat, and through a mixture of gentic alterations and careful psychological training taught the Souldrinkers to use up their excess heat in melting icebergs, so that the water could be collected and used for human purposes. The Souldrinkers were allowed to drink from the water too, to keep them healthy and allow them to work for longer peroids at a stretch. However, desperate for proper food, the captive Souldrinkers escaped, and began once again to prey on humans, and with a way to vent their excess heat and an unlimited source of fresh, clean water, began to dominate the southern continents. As the human race dwindled down to only a few struggling colonies, the last of the poets, Aristh Avel, wrote the following opening verse in his last epic, entitled Souldrunk. Surely the humans shall meet their demise. Giant filter feeders with gaping mouths they swim through the ocean, filtering nourishment out of the water. For these creatures, icebergs are a rich source of nutrients. The water passes out through passages all along its body, but its outer surface is so cold an icy coating develops soon after birth (as it starts swimming around). This icy mass both protects and insulates the creature, but because of the high purity of the filtered coating, the Kretorius have become a commodity. With global warming on the horizon, they're hunted and sold to drought ridden countries. like many evolutionary dead ends, this giant medusa/octopus hybrid died off because of its sheer size and the impracticallity of its feeding process : it lived off of small animals within icebergs , on which it used to climb and swallow fully ..
With an elastic-like, unhinging jaw, the Iceberg Devourer attacks from below with its fierce predatory menace. Beware! This thing just loves the other tip of the iceberg! It has a hard body to withstand the depths of the seas where it feeds on the ice. It uses a firey heat from inside to chomp through the ice, working its way up! Usually it only has enough fire to get through one iceburg at a time, and then has to refuel. Bore Whales have evolved in to the ultimate iceberg demolishing creatures. The ‘worker’ class of these large, loyal and social animals are known to travel in large schools capable of devouring entire icebergs at the speed a large cruise liner can travel. Bore Whales a have large round mouth which creates a perfect suction on solid ice bergs and by quickly constricting then releasing their spiral jaw muscles they are able to spin their angled, razor-sharp teeth and grind through ice in a circular drilling motion. Faithful subjects to their Queen Whale, these massive mammals work tirelessly, swimming ahead of her burrowing tunnels through the ice offering her an unobstructed journey. Humans have discovered by breeding these worker whales along side a boat they can be easily fooled in to believing that a boat is their Queen Whale. The whales will then grow to be loyal workers clearing a path where ever the boat travels. This huge crustacean is the sole survivor of the precambrian era, it has grown immense over millions of years. It is very rarely seen, as it lives in the deepest parts of the ocean. It has a strange habit of coming up every couple of months to take a big chunk of ice with it back into the murky depths. It does this because its eggs cannot survive in salt water. the creature takes the ice into a huge underwater cave system off the coast of Antartica, which also has several large hydrothermal vents inside. The vents melt the ice and it quickly floats to the top of the cave. the mother covers the eggs in a sticky mucus and sticks them to the top of the cave. the mother has to constantly resurface to bring back fresh water, in the form of Glaciers. Due to its immense size, there are very few cave systems in the world, and even less with Hydrothermal vents that can accomadate them. This has kept their population low over the eons, and yet this has insured their survival, because the competition for food would be too great otherwise. Only old sailors accounts of a terrible sea monster remain to prove the existence of this creature, but the penguins know the truth. Last edited by Joey-b; September 24th, 2006 at 07:49 AM. Jesus, Tyranx. Awesome job. Got my vote easily. One of these days i'm gonna figure out how you do that. Lots of other good entries from: Jakkas, Tom Garden, VegasMike, Cloister, FozzyBar, and Lodin. My vote was for Ostrander. Very funny, great Idea. Looks just like the movie poster, and the creature is a great design too, huge head and a tail. Funny stuff. Tyranx, love the penguin perspective, really makes the creature looks huge. I like this picture very much. Fozzy, Always have such colorfull creatures, very cool and original designs. Reminds me of a wind surfing thing. Tom Garden, Love the lighting on that guy, looks like an underwater crazy tree guy. great creature. Tyranx - i lovee yours too, concept is great picture cool. too many good enties this week. hard to choose. Voted for xgabo for the great rendering style + cool concept idea. Fozzy, Cognition, Ostrander, Blkcelebration and Jakkas yours had awesome redering/ideas aswell. OH MAN, you got to be kidding me!!! SOOO MANY GOOD ENTRIES HERE!!! Cloister, that is one of my favorites, you should maybe polish it more since it is such a pretty, warm scene. I'd improve the horns and the tail fin. Also the right claw hand. Great job! Tyranx, I scrolled down and when I saw half of your picture, I thought - oh, this is the guy who did the scared rabbit (with the 50-armed awesome creature)! Awesome style and skill. Man, you might just win this round! njoo: Sooo cute! Dig the little critter! One of my faves, no doubt! JakkaS: Once again, the most handsomly rendered creature here. Beautiful, lovely, keeper! cognition.SB: You got my vote! The wave pattern flattens out the pic somewhat, but the creature, while not the most out-there design, rules! Yes, this is a creepy scenary to behold - imagine seing this from a helicopter! OH SH...!!! Awesome pic! njoo got my vote: Adore the design. Seems very believable (in a fantasy kinda way) and I love that it blends in with the environment. Tyranx, Jakkas - Great pieces as always. Tyranx, your piece reminds me of some of Sparth's landscapes with all the blank space. Cool stuff also Lodin, Fozzy, xgabo, Vegasmike, BlkCelebration. Cloister - your rendering's getting better. Just one thing that bugs me is the studio-type lighting on the iceberg. Looks like you've got a big tungsten set up left of the image, because the side away from the sun is fully lit. Anyway, thanks for the comments wizo, dragon, and cheers for the vote! Thanks for the crit, too... I'll try and make the waves fade out or something. apparently my image host was having problems before, but it seems to be back. Let me know if any of you have problems visualizing my image. Tyranx, amazingly well rendered, but since this is about concept, I went with njoo. Beautifully rendered, really awesome looking creature, and love the finishing details like the animals falling off it's back. Great stuff people, hard to judge. ScaryPotato: Nice one, maybe add a little more detail in your next entry. llothcat: Good concept, post bigger! kovah: The concept doesnt really come across, maybe it needs some more texturing/detailing. Joey-b: Nice colors. The perspective of the mouth seems a bit off. Durin/Piru: Hehe, nice creature. His pose doesnt look natural though. njoo: Love the soft, aquarel like colors. Perspective is weird though. Try flipping your image to check where its off. Eric Gerhard: Try blending your brushstrokes a bit more, they distract a lot, especially in the foreground. Evil_Sloth: Nice, but the depth in the pic doesnt come off, because the colors of the creature are bit too saturated. zhay13: Nice, but hard to make out what goes into the background or foreground. Try less saturation as you go further back in the pic. kid_militia: Looks very much like a blue whale. The composition is hard to read. Cloister: Wow, excellent entry, youre growing a lot lately. Love the colors. Keep an eye on the perspective, especially on the surface of the water. The water in the front plane is very Jakkasian. Moai: Nice one, great inlays. Try to get rid of the black outlines on the creature a bit more. Blue: Good concept, looks very unfinished though. Michael Jaecks: Nice pic, but the creature seems a bit underdesigned. Could use a little more detailing here and there. xgabo: Lovely. Even though there are some perspective issues, the whole is very nice. Love the bear. cowboy surfer: Nice one, but need a bit more work. Fozzybar: Lovely coloring, but the scale is a bit hard to judge. Could easily be a small creature hugging a little ice lump. Maybe add a little more detail. And some less satured colors to suggest more depth/size. wizo5454: Nice pic, the creature doesnt look very big though. The surroundings may be a bit too flat. BlkCelebration: Nice one, love the expression its face. The water is a bit flat though. JakkaS: Wow, great job. Only crit is that the surroundings are prettier then the creature. And it looks very antlike, even if the little details set it apart. It's hard not to vote for you every week. Where is that purple dude with the spoon? I thought he was great! vonky: Try looking at some animal anatomy pics to see how animals are usually build. They tend to share a lot of characteristics which you can use to make your creatures more believable. Take a good look at joints and muscle and try some sketches from reference. cognition.sb: Nice one, love the ocean surface. From the perspective of that surface it would seem we should be able to seem more inside the creature's mouth. ckaos@om: Nice colors, the creature needs a bit more detail on its skin I think. Ostrander: Those letters are way too distracting. Its hard to see anything else but COW on that pic. The rest of the pic is great and it would be a big favorite if it wasnt for those big red screaming COW letters in there. Design and coloring are great. Tom Garden: Nice concept, would love to have seen it actually chomping on an iceberg though. gep: Very blue, try broadening the spectrum of the colors a bit to make the eye of the viewer wander a bit more. Tyranx: Nice concept and background story, and amazing pic. 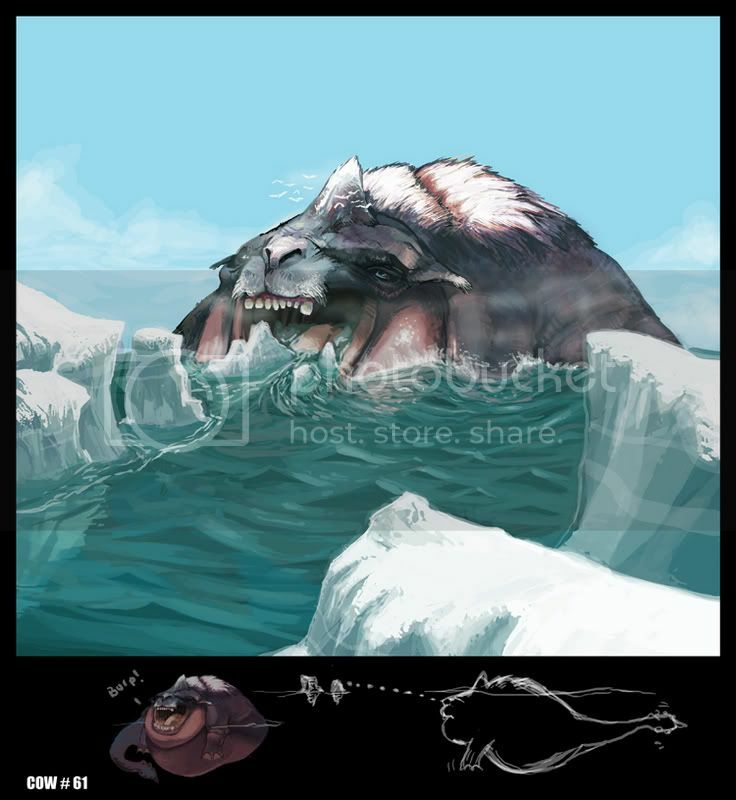 Its also a bit more of a iceberg hugger/bring alonger instead of a devourer. I didnt think they'd have anything more evolved then sponges or medusas in the pre cambrian era though. Then again, this is cow. It was very hard to choose this round with lots of excellent entries, but in the end I settled for Njoo, the best combination of concept and execution. Oh my, as always - such a tough decision! I so wanted to join in the fun this time, but alas, this wasn't the week for it. Lodin - I love the movement in your picture, that ice going up like that! Sweet. zhay13 - those creatures are actually very cute! I don't know how..but they are! Cloister - Im still amazed how your picture looks so ...warm and welcoming, despite still having the feeling of ice and cold water. The lighting is amazing. the creature is precious. VegasMike - stinnung! I love the colors and the hot/cold contrast of the creature. xgabo - that one was my favorite. I adore the bear on the top, I didn't notice it right away, but it completed the image for me. JakkaS - love it! As always, mindblowing stuff. Ostrander - I love the fat creature! The bigger the jaws - the cooler the fish for me! xgabo got my vote this time around, but everyone did a great job! Nice work everyone! I think there are some really strong entries in this round, but voted for VegasMike's entry. I really liked the overall style, and the story goes along with it perfectly, plus anything with a mouth big enough to eat an iceberg whole is a devourer in the truest sense. Thanks for the comment Supervlieg, I wasn't able to spend nearly as much time as I would have liked on it as I am getting ready to move, but at the same time was trying to emulate the style of an old painter (AJ Casson) who always does simplified forms and colours. I'll try a new style with this next COW (it came from above)! Yeah that`s it...... It`s very good to know CA admnistrators try to be the most fair as possible. This fills me with pride to be among you guys. Tyranx, I scrolled down and when I saw half of your picture, I thought - oh, this is the guy who did the scared rabbit (with the 50-armed awesome creature)! >supervlieg : Yes it is :p. After your Lesson . Thanks. My vote is for Ostrander. Many great render Tyranx (as usual, give me your cheat code! ), Jakkas, vegas mike, tom garden...So I have find an original touch with his funny touch and his "Jaws" poster. I'll have one vote for Tyranx, please. You might be going down next week. That is, if you participate and someone else does a better job. Fozzy...can you give them ALL a COW? I eman seriously...they've outdone themselves! These are all INCREDIBLE! I just can't choose! This one is sure one of the best COWs ever! I like Tyranx draw too. Kind of a real environment. Voted Xgabo, just love the underwater rendering + the polar bear is a funny touch! runner ups: tyranx, ostrander and cloister. Some very sweet desings! Scary Potatoe - Creature nicely rendered, ice looks weak. Llothcat - Great, really cute. Kovah - I can see where you are coming from, look at whales to hone anatomy. Joey-b - Man you improve every round! Only niggle would be the ice exploding upwards not as good as the rest of the piece. Durin - Let down by the background. Try to tighten the render next round. Njoo - Awesome, very believable. Lodin - Excellent energy. Would improve the right fist, too human. Eric Gerhard - Well thought out concept, pity Joey-B did the creature first. Evil Sloth - Well painted background, creature a bit washed out, sound effect spoils it. Good effort. Zhay - A bit messy hard to see whats going on. Kid M - No clue whats going on in yours, try to clean it up next round. Good concept. Cloister - Best yet! Lovely light. Think you could improve the tail though. Moai - Great concept. Love the skin textures. Like the way your love of dinosaurs allways shows through! Blue - Good idea, looking very pixelly though. Vegas Mike - Awesome and beautiful. Sums up the sound effect in my head for devouring an iceberg. Great scale, love the underwater light. Well done. MJ - Good looking creature, nice energy. `Berg is the weak point for me. Xgabo - Brilliant. Bear is a great touch. Nice setting. Cowboy - Looking too lame, no scale, try harder. Fozzy - Beautiful colours. Love the sail idea. Agree scale is hard to judge. Wizo - Nice ideas. Try to tighten up the render next time, messy looking. BLK - Great scale. Great idea. Jakkas - Awesome ice rendering. Truely inspiring. Dont think the ant looks at home on the ice though. Vonky - Nice effort. Try to work on values. Picture parts all blend into each other. Cognition - Truly excellent perspective. Really suits the creature. Although i love the water effect I think the colour is wrong. Ckaos - Not sure how it wold get on the `berg. Picture a bit flat, try to give it depth. Ostrander - Great sense of humour. Lovely render. My only crit would be that the creature would not be able to digest the `berg. Tom G - Excellent and menacing. Would like to have seen it devouring though. Gep - Good creature design. Like my last round though, I think you overdid the white. Tyranx - Like all the entries I have seen from you, very cinematic. Love the penguin pov. Pic feels cold. Only niggle would be lower end of creature looks flat. Helps to focus attention on main part of pic though. So in conclussion I voted for Vegas Mike. Summed up what I couldnt but wanted to concieve. Great render, lighting and perspective. Well done everyone, really high standard.